Hosted Graphite provides an Amazon AWS CloudWatch add-on available in the Add-Ons page of your account. This add-on syncs the metrics from the specified AWS services/regions into your account. 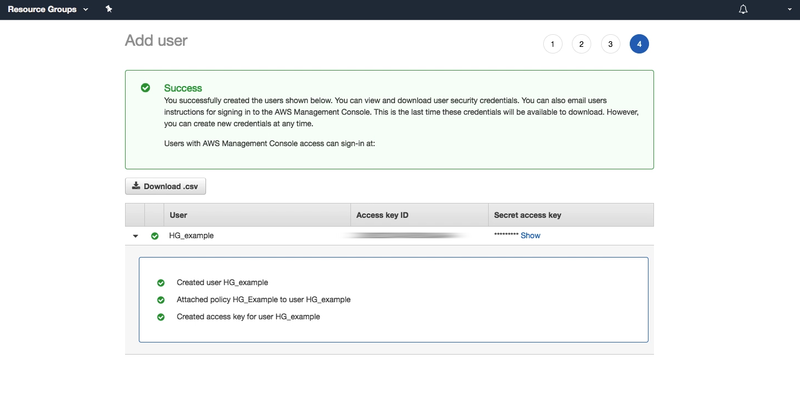 To connect to your CloudWatch account, you need to setup Identity and Access Management (IAM) access keys in your AWS Account, with the appropriate permissions to allow Hosted Graphite to connect and collect your metrics. Let’s create a policy that we will later attach to the user. In the IAM Dashboard, click on Policies (on the left) or Customer Managed Policies in under IAM Resources, then click on Create Policy. Switch to the JSON tab, replace the existing text with the policy provided below and click ‘Review policy‘. Give the policy a name (Eg: HG_policy) and a description (optional). Save the policy by clicking ‘Create Policy‘. With the policy set up, we’ll create a user to attach the policy to. We’ll use the Access Key/Secret Key tokens to give Hosted Graphite permission to import CloudWatch metric data. In the IAM Console, click on ‘Users‘ on the left or under IAM Resources. Then select ‘Add User‘. Give the user a name (Eg: HG_addon) and ‘Programmatic access‘ for the Access type. Click ‘Next: Permissions‘ and click the ‘Attach existing policies directly‘ button along the top. Search for the policy we just created and attach it by clicking the corresponding checkbox, then press ‘Next: Review‘. Click on ‘Create User‘ and copy the the Access Key and Secret Key into the relevant fields on the add-on set-up page here. Optionally, you can download a copy of this account information, but keep it safe as this information can be sensitive. AWS metrics for estimated billing charges are calculated and sent several times a day to Amazon CloudWatch. They are stored in the US East (N. Virginia) Region and represent charges for AWS services worldwide. To enable this feature, it needs to activated in the Billing and Cost Management console. Details can be found in the Amazon CloudWatch Documentation. Amazon Route53 metrics are only received if you enable US East (N. Virginia) as the current region. These metrics are not available from any other region. To enable the CloudWatch add-on, go to the add-ons page in your Hosted Graphite account and choose the option for Amazon AWS CloudWatch. 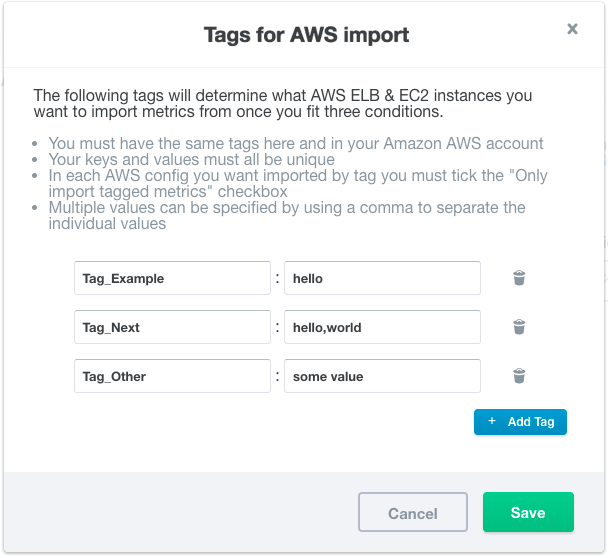 If you click AWS Tags you will be presented with the following screen which allows you to edit the tags. Each tag has a unique name (shown on the left) and one or more values. Values are separated by a comma. If for example you enter “hello, world” for tag “Tag_Next” then the CloudWatch Add-On will match any tag called “Tag_Next” that has either “hello” or “world” as its value. If you click Cancel and go back to the previous screen and click Account Names, you can see this screen from which you can edit a particular AWS configuration. These are the keys you saved when you set up your IAM user. Choose the regions containing the services you wish to monitor. You must choose at least one region. Choose the services which will be queried for metrics. Choose the services that you would like to enable tagged imports for. This will only import metrics from tagged resources for those services. Once you enable this per account, you can type in the tag’s “key”: “value” pairs that you would like to be imported. These key values must also be present in your AWS resources to be imported successfully. For more information on adding these tags go to the AWS docs. When you click on ‘Save‘, some basic checks will be performed on your keys if successful, your configuration will be saved. If you have at least one service chosen, the cloudwatch add-on will be enabled. Go to the add-ons page in your Hosted Graphite account, and choose the option for Amazon AWS CloudWatch. Click the Delete button and the CloudWatch add-on will be disabled for that account. If you use multiple AWS Access Keys on your Hosted Graphite account for different AWS accounts, projects or environments, you can keep the metrics separated by assigning Account Names to your Access Keys. 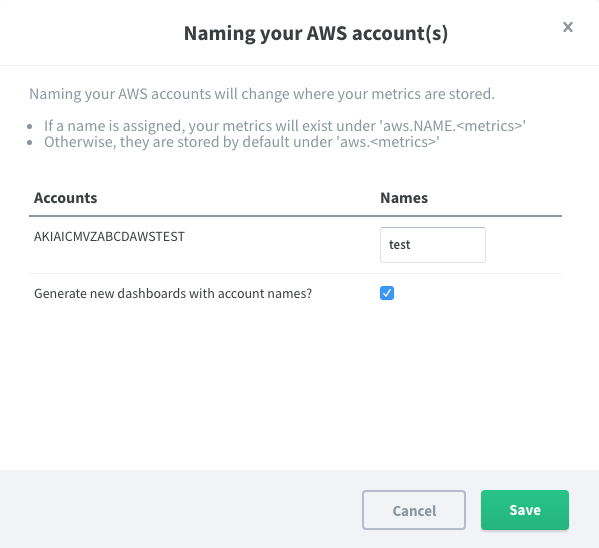 If you were previously not using an Account Name and have recently added one, your automatically generated AWS Dashboards will no longer map to the correct metrics. You can tick the option on the Account Names screen (above) to generate new dashboards which use the new Account Names. service - A short token representing the service, e.g. ec2, or rds. region - The AWS region, e.g. us-east-1. grouping - A short token representing the grouping (‘dimension’ in AWS speak) for the metric, e.g. inst for InstanceId. id - The identifier for the service/instance, e.g. Instance id or Name tag for EC2. metricname - The AWS metric name is directly used, e.g. CPUUtilization. So, for example, the CPUUtilization metric for the ‘i-abcd1234‘ EC2 instance in Virigina will be imported as ‘aws.ec2.us-east-1.inst.i-abcd1234.CPUUtilization‘. While we attempt to minimise the number of API calls which may incur Amazon charges, Hosted Graphite disclaims responsibility for potential costs incurred by use of this add-on. Our add-on performs read-only requests to the CloudWatch API. Should the provided AWS Access Keys grant greater privileges than what our specified IAM Policy defines, responsibility for any activity performed using those keys lies with the customer. Amazon AWS offers the first one million API requests at no charge. In excess of that, Amazon will charge $0.01 per 1000 requests. See the CloudWatch Pricing page for more information on Amazon pricing. We aim to make as few requests as possible to fetch your metrics. If you have many instances, or are monitoring many services, you will likely exceed this boundary. If this is the case, these charges will be likely be negligible in comparison to what Amazon charges just to have monitoring enabled for those services.